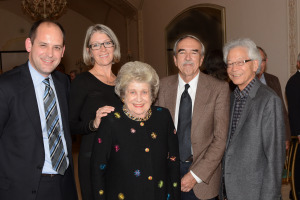 On November 6, 2014, the 640 Foundation and San Francisco Heritage joined together for the first time to sponsor the inaugural Alice Ross Carey Memorial Lecture. 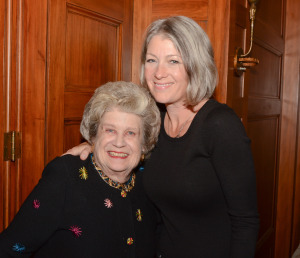 The Foundation welcomed members of San Francisco Heritage and a happy complement of their guests to Dr. Anthea Hartig’s fascinating and very personal presentation and the elegant dinner that followed in our historic Club building. Attendees of the sold-out lecture included many preservation architecture and design professionals as well as members of local, state and national organizations and committees in the field. It was a pleasure to share the Club with so many appreciative visitors and to make new friends. The program began with the warm greetings by 640 Foundation Co-President Carol Ann Rogers, and Heritage Executive Director Michael Buhler. Then Anthea, California Historical Society Executive Director and a very close friend of Alice’s, took over. She acknowledged Alice’s husband Paul Fisher and Hisashi “Bill” Sugaya of Carey and Company, and shared tales and photographs from Alice’s life, dating from childhood through her memorable career as a preservation architect. In preparing her remarks, Anthea inter viewed many of Alice’s friends and colleagues, and amassed such a wealth of information and so many engaging photographs and quotes that even those individuals who knew Alice best learned something more about this amazing woman: Her undergraduate study at the University of Colorado in the late 1960’s where, “She dove deep into the waters of civil rights, women’s rights, pro-peace and pro-love swirling through college campuses and the nation and the world.” Her move to San Francisco “the epicenter of it all” and her work in the construction trades prior to graduate school in architecture at the University of California, Berkeley, and on and on. Tap dancing and fighting and learning and giving. Anthea noted Paul Fisher recalling Alice as, “a beautiful combination of Little Nell and Lady Macbeth”. As a highly accomplished and acclaimed preservationist and an active member of the Metropolitan Club, Alice gave the Club and the 640 Foundation countless hours of service and advice about preserving the beloved Club building, teaching us about the, “complicated web that remains to this day of compliance, restraint, magic, deftness—-all that is preservation architectural practice”. The 640 Foundation thanks Club member and former member of the 640 Foundation Board Anthea Hartig for her very engaging message about this very special lady and Gee Gee Platt, 640 Board member and chair of the event, a consummate preservationist in her own right, for making everything come together. The tradition of the Alice Ross Carey Memorial Lecture continued in 2015 with a presentation by Erin Garcia, curator of the California Historical Society’s exhibition, “City Rising: San Francisco and the 1915 World’s Fair,” speaking about women at the 1915 Pan Pacific International Exposition in San Francisco. In 2016, renowned Architectural Historian Michael R. Corbett, who prepared the Metropolitan Club’s 2004 National Register nomination, has delved more fully into the lives and body of work of the Club’s architects Bliss and Faville, a project never before undertaken and will present a presentation on their work and impact on design. In 2017, the Foundation is proud to present “Ruins to Redemption: Historic Preservation Fund Committee”, on October 19, 2017. This presentation explained how a small band of preservationists held the City and a developer accountable, creating the $2.5 million Historic Preservation Fund and Committee in 2005. In 2018, Denise Clifton presented her book, Tables from the Rubble: How the Restaurants That Arose After the Great Quake of 1906 Still Feeds San Francisco Today. In September 2019, we are proud to announce that the sixth annual Alice Ross Carey Memorial Lecture will be held at 640 Sutter Street.